Water and extreme sports enthusiasts have met their match. 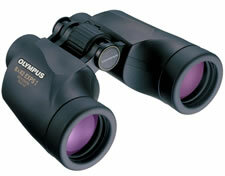 These top-quality roof prism binoculars boast a sealed, nitrogen-gas-filled construction that prevents fogging and condensation. 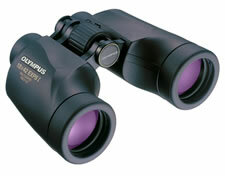 Nitrogen-filled waterproof binoculars. Long eye relief and adjustable eyepieces (twist up/down). High-index BaK4 prisms. Environmentally friendly lead-free glasses. Prism type: Roof-prism.  Magnification: 10x. 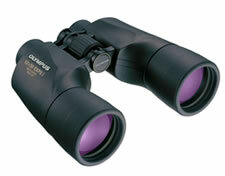  Objective Lens Diameter: 42 mm.  Exit Pupil Diameter: 4.2mm  Angle Of View: 6.0°.  Eye Relief: 15 mm.  Closest Focal Point: 3 m.  Size: 129 x 145 x 53 mm.  Weight: 660 g.
Prism type: Roof-prism.  Magnification: 8x.  Objective Lens Diameter: 42 mm.  Exit Pupil Diameter: 5.3mm  Angle Of View: 6.3°.  Eye Relief: 19 mm.  Closest Focal Point: 3 m.  Size: 129 x 145 x 53 mm.  Weight: 650 g.